Enjoy this tasty peanut butter pie made with chocolate pudding, vanilla wafers and COOL WHIP. Mile-High Peanut Butter Pie takes only 20 minutes to prep. Combine wafer crumbs and butter; press onto bottom and up side of 9-inch pie plate. Bake 10 min. ; cool. Beat chocolate pudding mix and 1 cup milk with whisk 2 min. (Pudding will be thick.) Spread onto bottom of crust. Gradually add remaining milk to cream cheese in large bowl, beating constantly with mixer until well blended. Add dry vanilla pudding mix; beat 2 min. Reserve 1 Tbsp. peanut butter. Add remaining peanut butter to vanilla pudding mixture; beat until blended. Gently stir in 1 cup COOL WHIP. Spread over chocolate pudding layer to within 1 inch of edge. Top with remaining COOL WHIP. Refrigerate 3 hours. When ready to serve, microwave remaining peanut butter in microwaveable bowl on HIGH 15 sec. or until melted when stirred. Melt chocolate as directed on package. 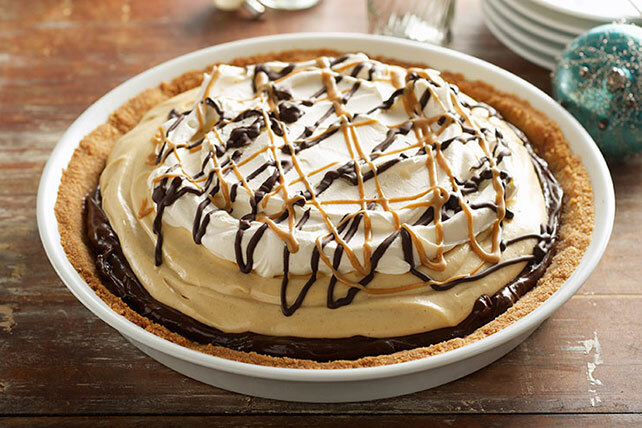 Drizzle peanut butter, then chocolate over pie. Prepare using reduced-fat vanilla wafers, fat-free milk, PHILADELPHIA Neufchatel Cheese, reduced-fat peanut butter, COOL WHIP LITE Whipped Topping, 1 pkg. (1.4 oz.) JELL-O Chocolate Flavor Sugar Free Instant Pudding and 1 pkg. (1 oz.) JELL-O Vanilla Flavor Sugar Free Fat Free Instant Pudding. Substitute 1 pkg. (3.3 oz.) JELL-O White Chocolate Flavor Instant Pudding for the vanilla pudding. Do not crush wafers. Place half the wafers in 1-1/2-qt. bowl. Prepare pudding mixtures as directed; spoon in layers over wafers. Top with remaining wafers and COOL WHIP; drizzle with melted peanut butter and chocolate. Prepare using JELL-O SIMPLY GOOD Chocolate Flavor Pudding and/or JELL-O SIMPLY GOOD Vanilla Bean Flavor Pudding.